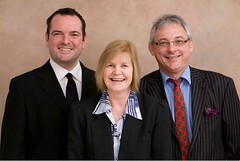 Open for Business - It's taken a month or so longer than planned but today we finally launched the New Ventures Team. I will still be riding two horses as Head of Business Information Systems too until we fill this position. Head of New Ventures is in some ways a big change from from my previous role at SQA. But it builds on earlier work and the remit offers huge potential. To develop new partnerships with publishers, broadcasters, industry and providers of learning materials. To explore new ways of working in Scotland and Internationally that add value to our portfolio of services. We hope to link engaging learning content to new dynamic ways of assessment and quality assurance and makes this I think one of the more exciting jobs in Scottish Education. We already have a number of projects with a range of partners underway - but we are happy to explore opportunities for partnership in Scotland, UK or Overseas. I am lucky to too have experienced support in Liam and Joan we are going to have a lot of fun as we take SQA into new places and Scottish education to new heights. I am hoping we can contribute and make use of the growing Open Educational Resource movement and drive developments that benefit Scottish Learners and the global learning community. Look forward to reading about new ventures here.